Apps often have to ask a lot—fill out this form, enable this integration, keep up with these updates—before users can benefit from the app's full value. After a while, necessary actions can start to feel like chores. 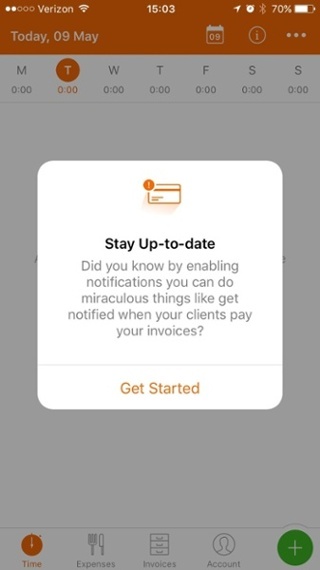 The key to motivating users to take meaningful actions over and over again is well-crafted in-app messages. Messages that can inform, guide, and delight keep users engaged from the first onboarding experience to the 100th time they log in. A good in-app message can turn even the dullest actions can turn into aha! moments. We'll explore how 10 apps have designed, positioned, and personalized their messages to users in ways that build deep, lasting engagement. Amid crowds of confused travelers at the airport, a woman bee-lines for a sign displaying her name. Personalization can mean the difference between chaos and calm. It's a great onboarding tactic, but can be used at any stage of the user lifecycle to keep the learning going. MailChimp's welcome page following sign-up is a masterful example. Large text introduces the user's arrival, calling her by name. 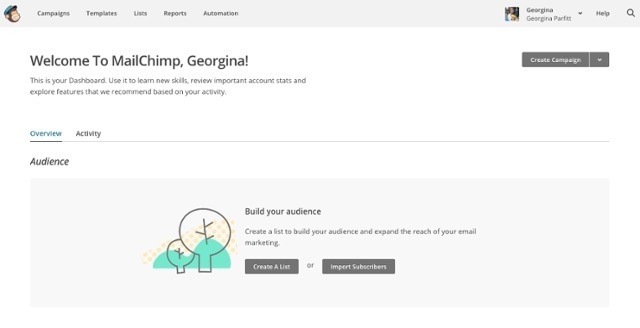 Then a box presents two CTAs, signposting the user towards two key actions that will get her to create her first campaigns. 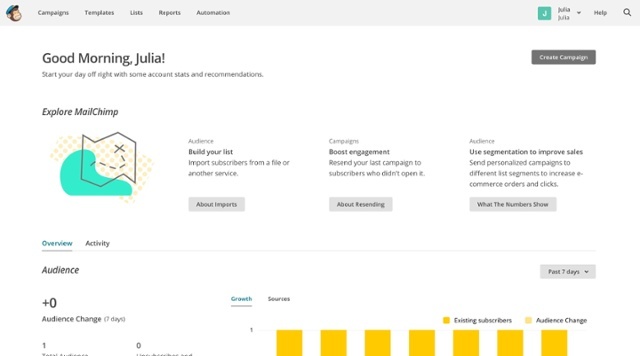 MailChimp continues to personalize the dashboard long after onboarding. Returning users see a friendly greeting, based on their time zone and first name every time they log back into MailChimp. Create simple dashboards that give your users a clear way into your app. Personalize to build familiarity and encourage a sense of ownership that will lead to greater exploration and engagement. When trying to gain feedback or more data from users, many apps make the mistake of using too many words. Exhaustive lists of options fill the screen and users get frustrated before they're even situated in-app. From there they're less keen to engage with your actual features. Instead, try getting that initial info from users by asking them to select pictures that match their answers. 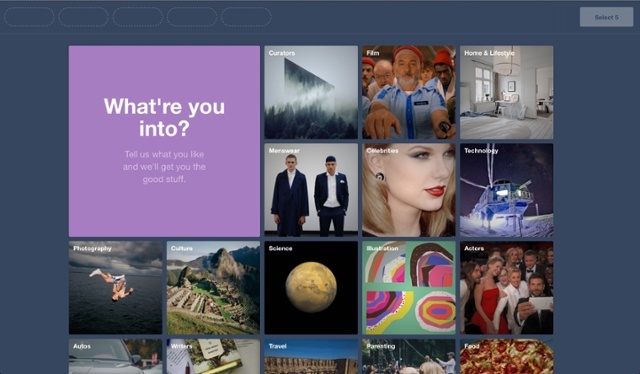 Tumblr is a place where people share their images and stories, so to get users off on an engaging foot, they use a picture board to collect their preferences and start customizing their experience straight away. No matter what your product, images can help users engage quicker. Try replacing your “what do you do?” survey with pictures showing people performing different roles. Or try adding images to surveys or your rating system so that users can respond impulsively and get back to work. If you redecorated your entire house, you wouldn't invite your friends in without showing them around. At the same time, you know your choice of wallpaper is probably more interesting to you than it is to them. Same goes for your product redesign. You want to show users how to take advantage of new features, but you don't want to force them into every nook and cranny. Dropbox solves this dilemma with their redesign tour. When you log in, a modal window pops up inviting you to explore new features. The tour illuminates how each new thing fits into the Dropbox flow with descriptions placed unobtrusively at the side and bottom of the screen. Most importantly, they give users the option to exit whenever they choose. They even have a modal with the option to exit after 2 steps. If you've redesigned your app, create an open-house tour—arrange tooltips to guide but let users roam on their own so that they're making their own discoveries. A high-level overview of a few features can be great for onboarding or introducing a product redesign, but when users are in a daily flow with your app, you want to ration out those tips so they don't feel like a to-do list. Harvest, a time-tracking app for teams, offers users a single tip when they log into the app. The tip positions the value first, so it's quick to skim, and then follows up with a “get started” CTA that takes the user right where they need to go. Users shouldn't feel like they're cramming for an app test — give a steady flow of bitesized tips so that they can actually take and learn from each one. Most users are juggling a lot of apps and tools in their daily lives. Give them an easy way to get reoriented by helping them set goals at the beginning of their session. Evernote uses a modal window to get straight to the point by getting users to log their daily goals. They present three options that reflect their core value, giving users a choice without being overwhelming. Depending on what the user chooses, they then provide a tip. Click “Organize Your Life” and they give an effective way to add their Chrome Extension—they know users will be better organized if they can quickly load Evernote from their desktop. Prepare users to achieve more in your app by orienting them as soon as they log in and reminding them what their goals are. It's a great way to create engagement right off the bat and build towards retention. Engaged users will play around in your app and figure out how to use it best for their needs, but others will be more reserved, sticking to the pathways and actions that they discovered during onboarding without exploring further. 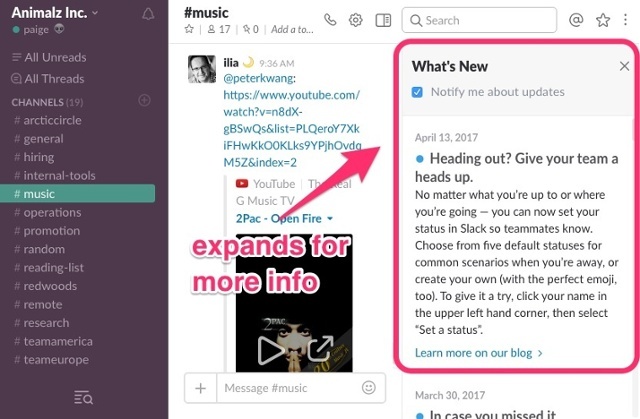 Get all users to engage further with give quick, easy suggestions to use the product better. 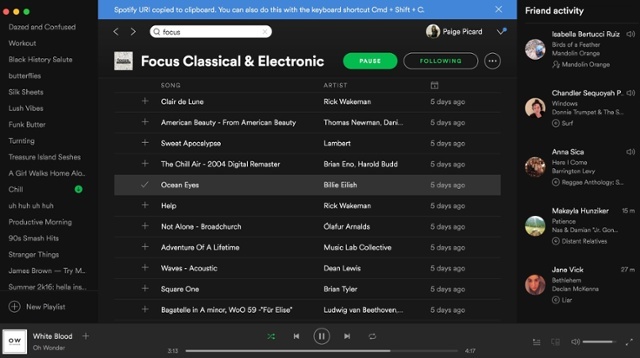 Spotify does this with a nifty top banner that offers single tips for more seamless interactions. Copying a URL triggers this shortcut tip, for example. Tips are triggered by certain actions, so they're always relevant to what the user's doing in-app. Keep teaching users as they play by creating triggered tool tips streamlined to your UI. Users will feel stimulated and rewarded for taking action, which will motivate them to engage further. When a user logs in, they don't want to spend time sorting through updates in order to get to their work. Keep a separate but visible place for new features and updates in your app's interface, where users can be tempted by new things but not distracted. 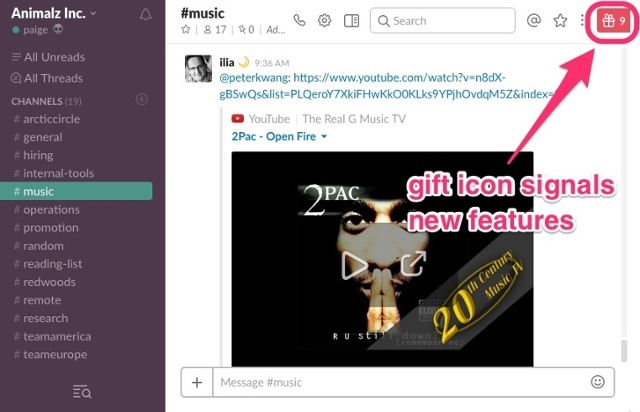 See how Slack hides their updates behind a little red gift box in the corner of the screen. When users are ready to explore, the icon expands. A bonus—the content is super clear and user-driven. “Give your team a heads up” is a great piece of copy. It's colloquial and totally focused on the user's pain point, allowing them to see the update's value immediately. Give users the power to get straight back to their work when they rejoin your app by keeping updates out of the way and letting users find them when they're actually ready to take action. Sometimes app users will need to complete an administrative step before they're able to take advantage of your features. This can add a lot of friction to your UX. One way to lessen this friction is to position these administrative asks in helpful places and at relevant times. Campaign Monitor, an email marketing tool for teams, needs users to complete the step of authenticating their company domain. 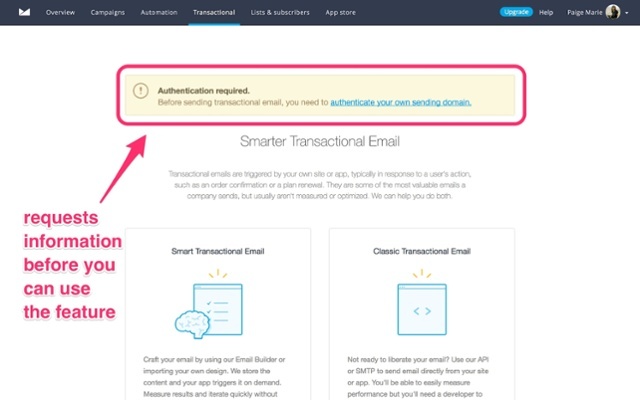 With this simple pop-up, users are briefly halted on their way to sending their first transactional email — they're situated in context and the action is easy to complete just by clicking the link. When users need help in order to use your tool effectively, don't wait for them to ask. Give a clear, contextual nudge right where they need it before a problem emerges. Keeping track of free trials is a real chore. Each tool's trial expires at a different time—sometimes the user wants to upgrade, other times they want to escape before their card is charged. Helping users out with this management chore can score your app extra brownie points. Accounting app Quickbooks leads by example by staying on top of users' trial status. During a free trial, a countdown sits unobtrusively in a top bar, yet its color makes it stand out on the page. It's easy to see and keeps the user constantly updated so they can focus on balancing their books. Keep users aware of their account status without getting in their face, so they can actually discover the best parts of your app before the trial runs out. The ultimate challenge for making app chores fun? Tax prep software. If an app can make you feel good while doing your taxes, you know it's doing something right. 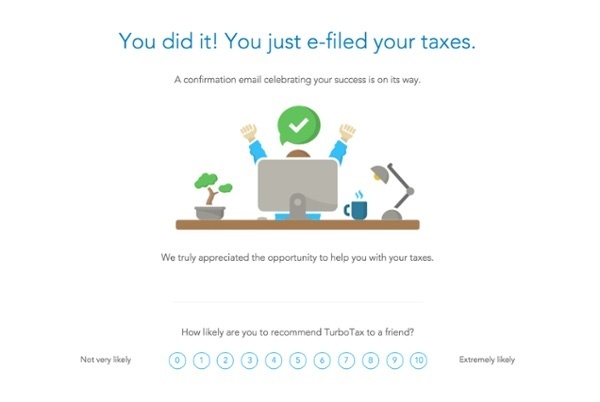 Here, TurboTax makes filing easier and more fun by placing in-app messages and notifications as users complete stages. Messages, like the “You did it!” celebration message below, serve as markers through the prep process, to give users a sense of progress. With these notifications, TurboTax makes something objectively dreadful kind of pleasant. Every app has some actions that just aren't that fun, but if you can use them to build a relationship, you'll set yourself apart from the competition and users will be more likely to stick around for the fun stuff. Don't say anything at all. Chores have no place in your app. Part of your work as you design and test your app is to put yourself in the user's shoes. Delve into every tiny action the user has to make in order to use your features to their full potential, and make sure every single one is serving a purpose — to deepen their engagement and get them to stick around.